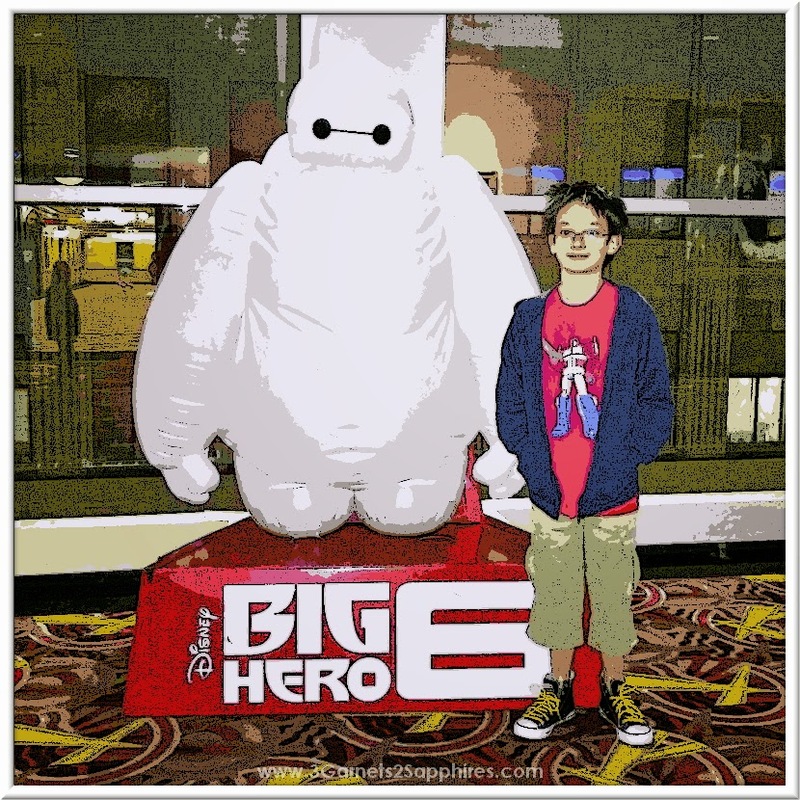 Our family was invited to attend a press screening of Big Hero 6 prior to the Disney movie opening in theaters. All opinions expressed are my own. My family and I had the opportunity to see Disney Big Hero 6 in 3D last week during an advanced screening. I can tell you I have been bursting at the seams waiting to tell the world about this movie. I’m not going to beat around the bush: Big Hero 6 is spectacular and is destined to become a mega blockbuster. Everybody should see this movie, young or old, . . . everybody. As a matter of fact, it should be mandatory! I first heard about Big Hero 6 on YouTube where I saw the trailer months and months ago. I could not wait to show my kids as I knew they were going to be as excited as I was to see it. To be honest, whenever Disney announces a new animated movie we are giddy in anticipation (who isn't? ), but something about this one really appealed to us and we were especially excited for the release. One of the reasons we were so excited to see the movie, was that one of the main characters, Hiro, looks exactly like my oldest son Jake. Dead ringer. It didn't take us long to realize that Jake had to dress up as Hiro at some point (see the how-to below). I think we nailed the costume and Jake was able to wear it to the screening! However, Jake is not the only person excited enough about Big Hero 6 to dress up….. I will be attending a comic convention event later this month dressed at the villain, Yokai! As you can probably tell, we really loved this movie. Big Hero 6 takes place in San Fransokyo (how awesome is that? ), a hybrid city made up from San Francisco and Tokyo. I was absolutely mesmerized by the scenery of San Fransokyo. The visuals were breathtaking. I would love to be able to navigate around that city and really take it all in, but the movie is so fast paced and exciting, you hardly get a chance. Hiro Hamada is a young boy genius with an older brother who is also gifted. Both are into robotics and have developed some amazing technology. I don't want to say too much more, but as you can guess, the other main character of the movie, Baymax, was one of their creations. There is no doubt Baymax is going to become one of Disney's most loved and cherished personalities. The entire theatre was in love within seconds of his entrance. His sole purpose is to heal and protect people, even to use humor as the best medicine for the job and he does it so endearingly you can't help but to love him. In addition to Hiro, his brother, and Baymax, there is a team of other cool and interesting characters that keep the story moving right along. I can honestly say that some of them could star in their own movie, but Hiro and Baymax clearly own Big Hero 6. It's tough to say much more about the story without spoiling the movie, but you can expect things to get action packed and exciting. Nobody in the world manages emotions like Disney does. We were laughing, jumping in our seats, and crying at very comfortable intervals throughout the entire movie. The kids were truly moved throughout with just the right levels of emotional stimulation. The scary parts were enough to give the kids (ages 7, 7, and 10) a jump (and net me a hand squeeze) but not too much to make them upset. The sad parts were enough to shed a light tear, but they were followed by humor and warm feelings to bring them right back. I am not ashamed to say I was just as emotionally moved as the kids were. In fact, the entire theatre was. We all laughed out loud, gasped in unison, and cheered regularly. Although this is a Disney movie, the story is Marvel. So make sure you look for all the little treats and Easter eggs you’d expect in a Marvel movie. They are there and you are going to love them. Big Hero 6 officially opens in theaters today, November 7th! I can’t wait for everybody else to see this movie so I can talk about everything without spoiling it! If you haven't guessed, I wholeheartedly recommend this movie. I cannot think of one type of person who would not enjoy it. TIP: Don't be late for the movie because the animated short that preceded Big Hero 6, Feast, was awesome! 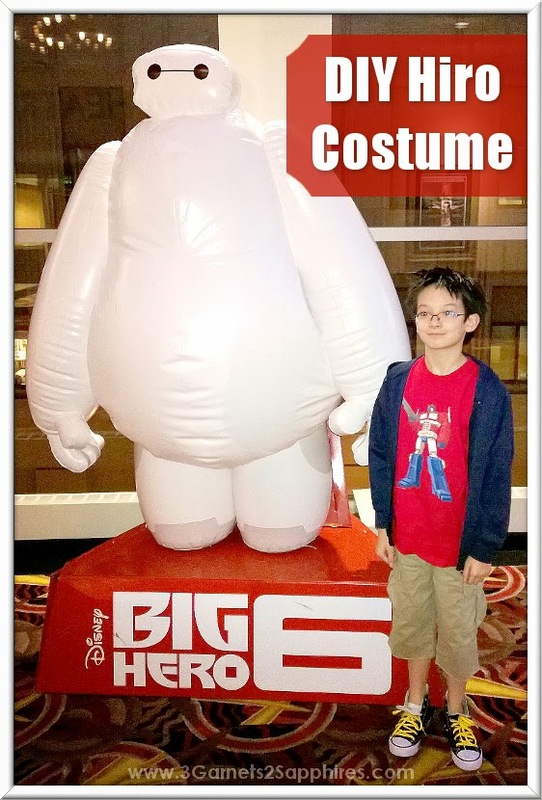 DIY Big Hero 6 Hiro Costume How-To . . .
Aside from accidentally forgetting the white t-shirt to layer underneath (due to our attempt to not be late for the screening), we were pretty pleased with our DIY Hiro costume! I hope I can take the family to see Big Hero 6 again soon…. or sneak out and see it again alone! To learn more about this movie, visit Big Hero 6 on Disney.com, Facebook, and Disney Animation on Twitter.